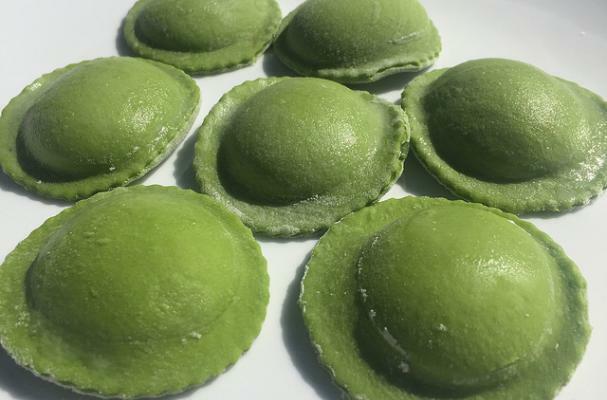 This St. Patrick's Day, show your love for all things green by creating stunning, handmade Green Ravioli with ease in the comfort of your own home! Founder Michael Finizio of Repast Supply Co. has created a delicious and nutritious recipe for Green Ravioli using their beautiful, sustainable Fonde Ravioli Rolling Pin (we have one and we love it!). Courtesy of Michael Finizio, Founder, Repast Supply Co. Step 1: Combine dough ingredients in a large mixing bowl and stir with fork until a ball has formed, if there are still some loose bits in the bowl that's fine. Step 2: Dump everything onto a smooth, clean floured surface. Step 3: Begin kneading with your hands for 1-2 minutes, sprinkling on more flour if dough feels too sticky. Step 4: Once ball is formed, wrap it in saran wrap while you prepare the filling. Step 5: Unwrap the ball of dough and cut it in half. Step 6: With a rolling pin, roll each half out into approximately 16" round, thin sheets. Step 7: Spread an even, 1/4" thick layer of filling on the front 2/3 of the first layer of dough. Step 8: Lay the 2nd layer of dough atop the filling and be sure to press out any air pockets that may have formed. Step 9: Dust the top layer of pasta once more with flour, and firmly roll the rolling pin once away from you. Be sure to go slowly and apply firm, downward force. Step 10: Cut your finished ravioli with a fluted pastry wheel or pizza cutter. Boil for 2-3 minutes and enjoy!